From left: Mitch Braff, Michael Berenbaum Jon Avnet Jon Voight Photo by Cindy Grosz. 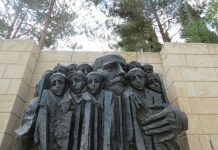 The Jewish Partisan Educational Foundation (JPEF) and the Sigi Ziering Institute of the American Jewish University held private screenings in Los Angeles and New York of the critically acclaimed film “Uprising” to coincide with the re-release of a curriculum about one of the most important feats of resistance during the Holocaust. “Uprising” was directed by Jon Avnet (Risky Business, Black Swan) and written by Avnet and Paul Brickman. This riveting narrative recounts the 28-day Jewish rebellion, a violent resistance that lasted longer than the country of Poland did against its occupiers. Jon Avnet and Jon Voight attended the New York screening. Avnet is known for his directing, producing and writing on both the big screen and television. His projects include Risky Business, Up Close and Personal, Fried Green Tomatoes, The Burning Bed, and the recent Three Christs. Avnet told me he is especially proud of this film. Growing up in Great Neck, he never learned about Jews resisting. “I was taught that Jews went to their deaths like ‘like a lamb to its slaughter.’ This is my first project relating to my own identity,” Avnet said. Avnet says his goal was to “give voice to those who no longer have voices.” He wanted the project to be as accurate as possible. He researched more than five years, spoke with over 250 survivors and read thousands of pages of diaries, essays, and books. He also worked with some of survivors, including Marek Edelman, whose stories were shared in the film. Jon Voight was nominated for an Emmy for his portrayal Nazi officer Jurgen Stroop in “Uprising.” Voight is honest, funny and tells a great story, something he claims his father was known for. Voight, an Academy Award winner for “Coming Home,” said he is happy with his work in Uprising. “I am so proud of this piece, my love for the ghetto fighters and rewatching it today, its importance in history,” Voight said. A newly-revised study guide, based on the 2001 movie, was written by Holocaust scholar Dr. Michael Berenbaum, who also served as an adviser on the film. The study guide is available from the JEPF website: www.jewishpartisans.org/uprising. “Many Jews don’t know about any partisans. There are many Jewish heroes, Jews saving Jews, and I am proud of working on this project with Jon Avnet because of its historical value,” said Mitch Braff, founder of the Jewish Partisan Education Foundation.